What is it: The next 3 line-up, complete with turbocharged MPS variant. Highlights: A very exciting debut for Mazda - and for Australia. The three-year-old Mazda3 topped the sales charts last month, helped along by incentives and run-out deals no doubt, and the new 3 is assured to continue as a strong seller. Two iterations of the 3 line-up will be on display: a 2.0 litre Mazda3 Maxx Sport sedan, and the 2.5 litre Mazda3 SP25 hatchback. While the 2.0-litre is carried over, the latter gets a 0.2-litre boost from its larger sibling, the Mazda6. The 3 will also retain its 2.0-litre diesel. More swoopy soft lines from the company's recent Nagare Series influence are obvious in both exterior and interior, and tech advanced include standard DSC and a sat-nav option. Mazda is also showing off the new, nostrilled MPS. It will be the global debut of the car. Australia-bound: Yes - April for the 3, third quarter for the MPS. Also-shows: An updated Mazda MX-5 Roadster. The Melbourne International Motor Show will host the world public debut of the new-generation Mazda3 MPS turbocharged performance hatchback. Australian showgoers will be the first in the world to see the new-generation Mazda3 MPS in the metal because Mazda has fast-tracked a high-performance Mazda3 MPS version of the new-generation Mazda3 range to the Melbourne International Motor Show and will roll it onto the stand early on March 4. The new-generation Mazda3 MPS high-performance hatchback makes its official debut during the invite-only Industry Day at the Geneva Auto Salon on March 3, but the public will have to wait until March 5 to gain entry. Show-going Australians, however, will be able to view the turbocharged hot hatch when the Melbourne International Motor show opens its doors at 10am on March 4. This is a huge coup for Australia and for hot hatch fans, and the second time Mazda has rushed a new car Downunder to the Melbourne International Motor Show. The Mazda MX-5 roadster starred at the show in 2005, again just hours after making its international debut in Geneva the night before. The Mazda3 MPS is the performance king of the new-generation Mazda3 range, and has the potential to rewrite affordable hot-hatch benchmarks, primarily with its feisty 2.3-litre turbo engine, and also through its finely-tuned chassis and sports suspension. The previous model's pedigree is proven in the toughest automotive environment - motorsport. The first-generation Mazda3 MPS has competed twice in Targa Tasmania - a five-day road race across Australia's smallest state - and finished in the top 10, amongst a field of Porsches, Lamborghinis, Evos and other exotica. new-generation Mazda3s, in sleek sedan and sporty SP25 hatchback form. The new-generation Mazda3 range makes significant advances in style, safety, value for money and driving spirit, and will be offered with a range of economical petrol and diesel engines. The new-generation Mazda3 will be the most significant new car at the Melbourne International Motor Show. Australians buy more Mazda3s than any other new car on the market, according to official January 2009 sales figures released by VFACTS. The new-generation Mazda3 range goes on sale in April 2009. 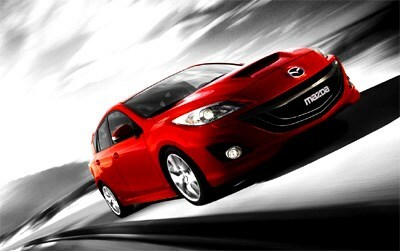 The Mazda3 MPS is slated for launch in Australia in the third quarter of 2009.